This is a sold as an unfinished Kit. I have tried my best to include as much information as possible, don't hesitate to e-mail a question. 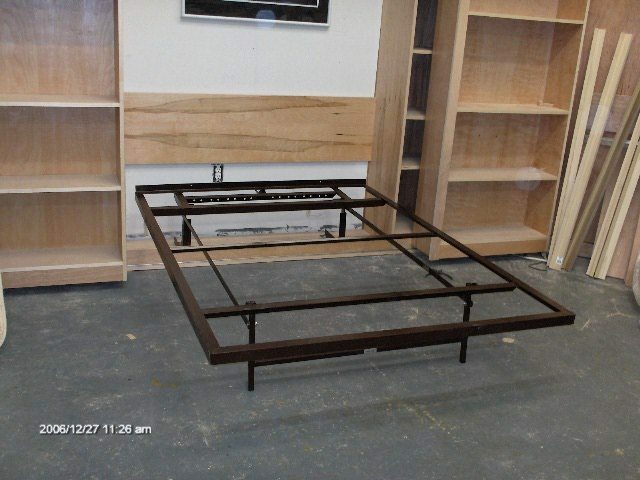 The only parts "not sold" with this kit is the bunkie board or 1/2 or 3/4 inch plywood screwed to metal frame, [mattress foundation] , and the mattress. The best mattress is 9-10 inches thick firm mattress. There are six operating shelves and 4 fixed shelves on the side cabinets. This leaves an opening af about 12 inches of each shelf. I am offering one extra operating shelf in the middle that most of my competition does not offer. The rolling shelves are all fixed. I will also be offering in the future a rolling cabinet with an opening in the middle so you have a nightstand while in bed. If this is something that interests you e-mail me and I will send a photo. We use a 11/16 steel continuous track on the base and top of the cabinet.This track can be painted to match the cabinet. We use six steel rollers with ball bearings per sliding cabinet, these are rated at 60 pound each, these rollers (wheels) are high quality sheaves[made in USA]. I mortice four of these wheels into the bottom of the rolling shelves. If you plan on heavy item's greater than 300 lbs. we can add sheaves @60 pounds each. The upper track I mortice in two sheaves. 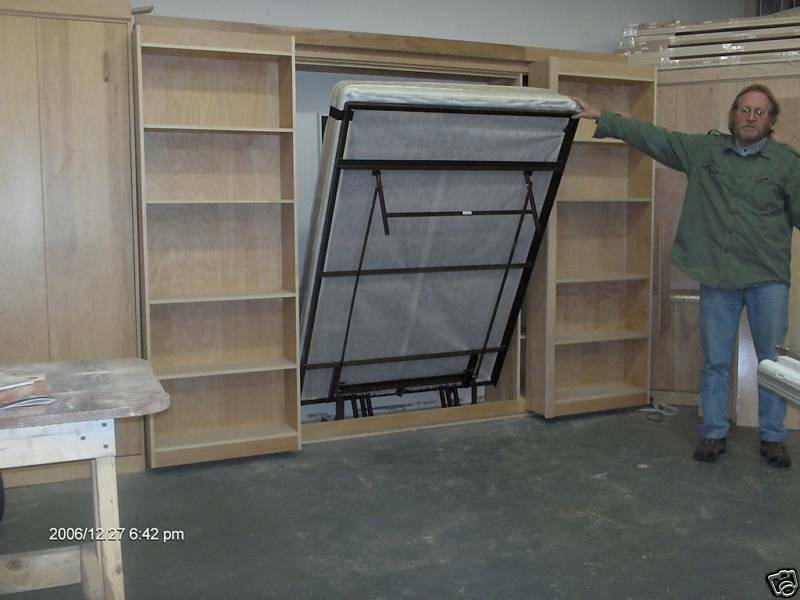 The rolling shelves are 31 inches wide by 9 inches deep. 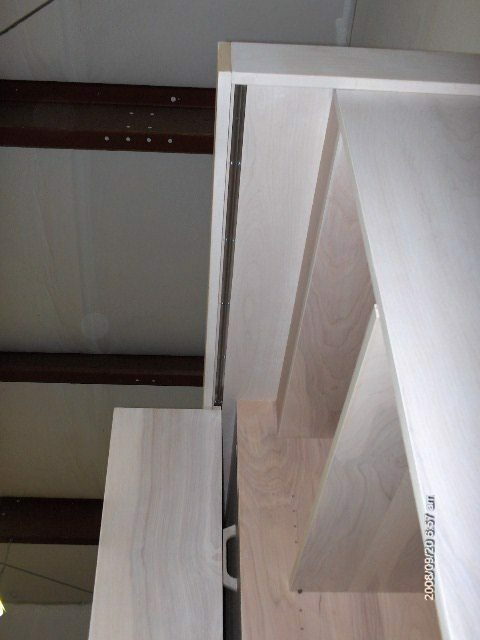 I rabbit out the back end of these vertical panels for the 1/4 plywood backs,. 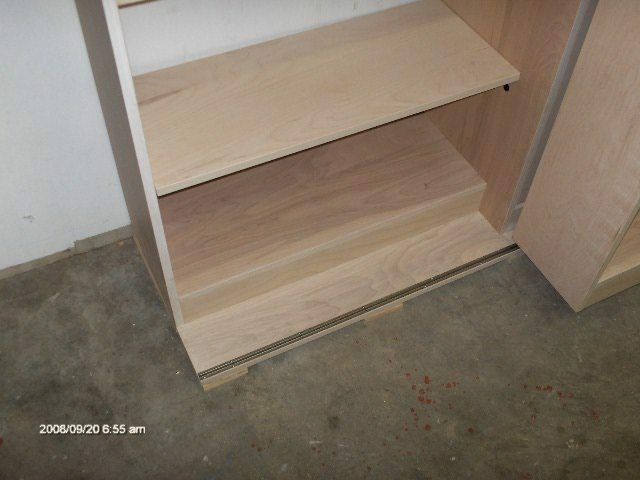 The full depth of the shelves for the rolling cabinets is 8 inches for books, and the side cabinets are 12 inches deep. I build a floor base for the whole unit 130 inches long . 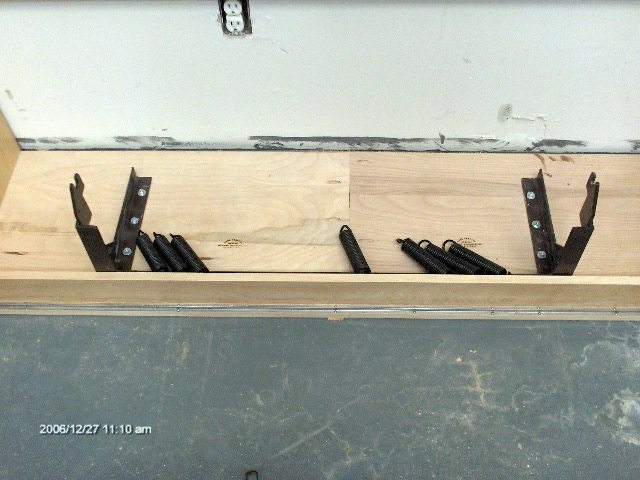 On the very end of front of the cabinet runs a stainless steel track 5/16" high by 11/16" wide. This track and rollers are made to hold 300 pounds. The same track runs at the very top of the bed, with trim covering it up. This makes the rolling shelves locked in place so the won't come off the track.If for some reason the shelf should become detached from the upper track I have installed a scalp or trim that comes down over the sheaves so as to block the cabinet from falling forward away from the wall.The scalp is attached to a piece of plywood 8 inches deep by 130 1/8 inches long with the track on it, it runs continuous across the front of the unit and is screwed into the top of the vertical panels and front braces with 1 5/8 screws. 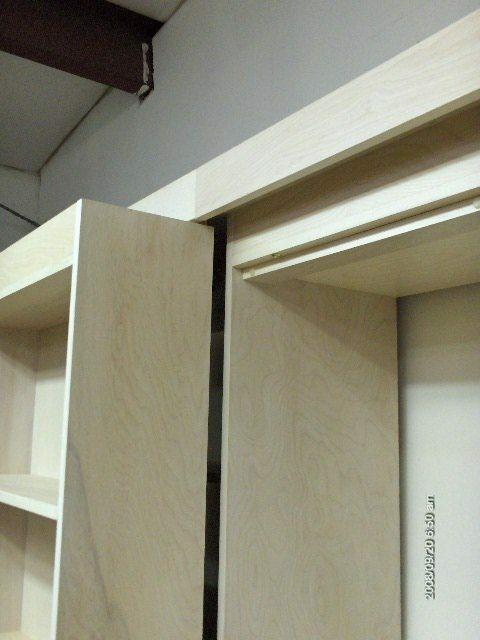 This process sandwiches the rolling cabinets in place.This unit comes with 1/4 birch plywood backs on the rolling cabinets. If you want backs on the side cabinets they are $75.00 each including shipping.This is considered an extra and should be added on while you are checking out. The top of the mattress down is about 20 inches off the floor. The bed cabinet is 130 wide with a 3/4 X 3 1/4 trim board returning to the wall on the ends.with this trim add 1 1/2 or about 132 inchs. The return trim is optional if the wall is close to the cabinet. The metal mattress is included with this sale. The mattress platform is not included with this sale. Most of my customers buy this local to save money Home Depot will cut up a sheet of 3/4 plywood and then you attach to the top of the metal frame. The shipping is more than the value of the plywood. I do offer a fabric and hardboard fold out platform shipped to your door for an extra $125.00. Please specify when you check out that you want this extra. 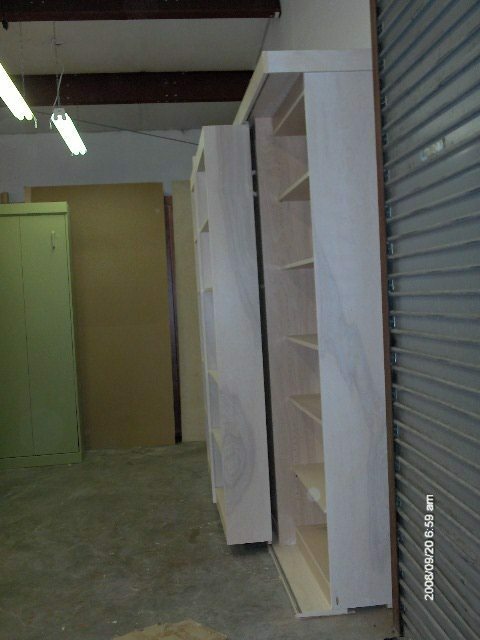 The bed cabinet is a total of 26 inches from the wall, in front of the rolling cabinets. I also add a floating headboard for an extra $100.00. this is for reading in bed. It comes in two pieces an 8 inch by 60 inch that attaches to the head of the metal frame and the floating part 18 inchs by 60 inches that you lean against. There is a fixed headboard [included]that this floats against so it doesn't hit the wall. 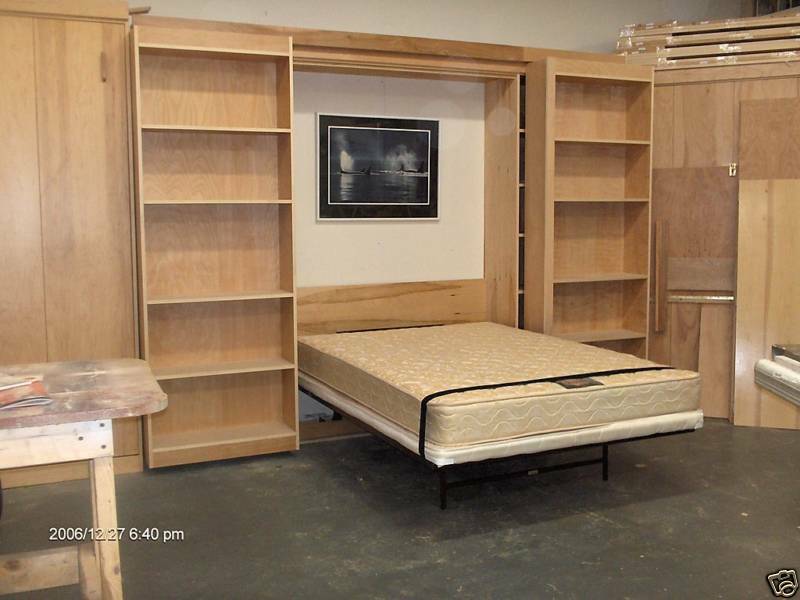 If you have the need for 15 1/4 inch side cabinets to match the bed cabinet it is $250.00 extra. Backs for the side cabinets are $75.00 each extra. If you are gong to stain the Birch, I recommend using a oil based wood conditioner [this eliminates possible blotching) The conditioner dries in 15 minutes then I roll on the stain( I like the natural by min-wax) Pecan looks real good too(like a violin). Wipe off the stain with a cloth, wait 8 hours and put 2-3 coats Satin water based polyurethane, sand with 220 grit sandpaper between coats,I like the Pro Series sold at Home Depot because it doesn't bubble up as much as the others (as it is drying take the brush and lightly go over the surface to blow up those little bubbles. Offered in OAK for 5% more. Please allow 4-6 weeks for the library bed. 9. Two 10 inch clamp. Nice but a helper would do, maybe. Shipping 300.00 in the USA: - Outside USA, Please contact me.